Arthur Sulzberger Jr., chairman of the The New York Times, surveyed a restaurant full of media elites yesterday and declared that his family would never sell the Times. 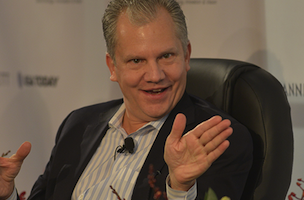 The Ochs-Sulzberger clan has owned the newspaper since 1896 and has a trust mechanism in place to ensure that the publication can’t be sold unless every single family member agrees, according to Sulzberger. “The family is united around its ownership and its responsibility to maintaining The New York Times and its journalism and its journalistic integrity,” he told interviewer and former Times media reporter Alex S. Jones at the Bryant Park Grill. 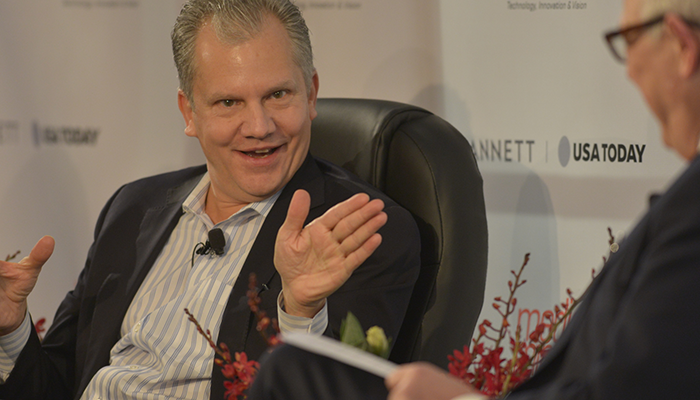 To maintain their ownership of the once-struggling paper, Sulzberger has worked with CEO Mark Thompson to increase the Times‘ stock price 300 percent in the last four years. Thompson, who joined the Times in 2012 after serving as director-general of the BBC, said that readers haven’t complained much about the paper’s new native advertising, which was introduced in January. However, he noted that revenue from subscriptions has been rising, while ad revenues have declined for 13 consecutive quarters. The Media Minds event, organized by Cathy Gay, was full of media and PR bigwigs, including Times executive editor Jill Abramson, Daily Beast editor-in-chief John Avlon, Daily News editor-in-chief Colin Myler and the New Yorker‘s Ken Auletta.